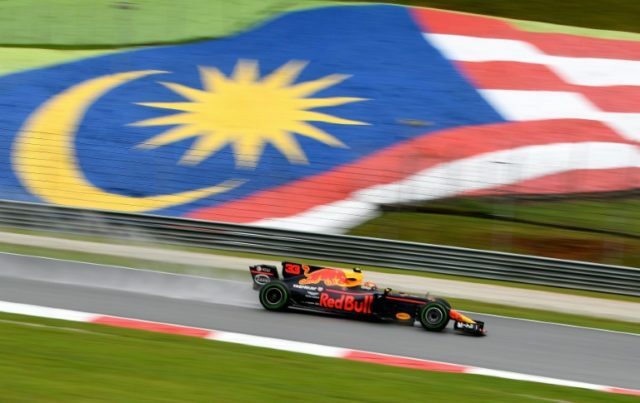 Sepang (Malaysia) (AFP) – The Red Bulls of Max Verstappen and Daniel Ricciardo set the early pace as the first practice session for the Malaysian Grand Prix was cut short by heavy rain on Friday. After the first 30 minutes were lost because of a flooded track, lap times tumbled towards the end of the truncated, hour-long session as the track dried and drivers switched to intermediate tyres. Verstappen managed just 11 laps in the session but his best at 1min 48.962sec was 0.757sec quicker than Ricciardo. Fernando Alonso left it till the last few minutes in his McLaren, adorned with a test halo driver protection system, to set some fast laps. Championship leader Lewis Hamilton did not bother to leave the shelter of the Mercedes garage until 30 minutes from the end of the session, and could only set the sixth fastest time. His 1:51.518 on the last of his eight timed laps of the 5.54 kilometre Sepang International Circuit was three seconds behind the leading Red Bull and eclipsed by both Ferraris. Hamilton’s championship rival Sebastian Vettel was fifth quickest in 1:51.009, four-tenths slower than Ferrari team-mate Kimi Raikkonen, who enjoyed his maiden grand prix win at the Malaysian track back in 2003. Rookie French driver Pierre Gasly stayed out longest in the trying conditions on his Formula One debut. The 21-year-old completed 14 laps in his Toro Rosso — more than any other driver in the session — with the best of 1:52.380 good enough for an impressive ninth place on the timing sheets.